Coenosia tigrina is a very common fly, found over the whole of Britain and Ireland, both in woodland and open localities. It is a small fly, (6 or 7 mm long) buff-grey with dark spots. Distinguished from other Coenosia by the combination of a pair of bristles very close to each other on the middle of the hind tibia and the mid and hind femora black with red tips. 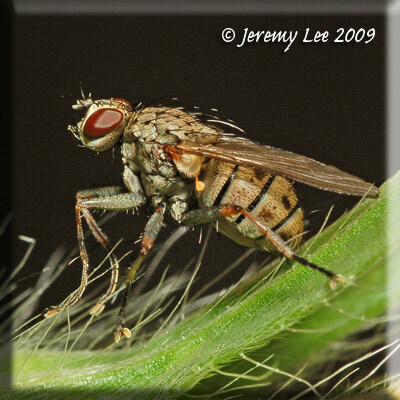 C. tigrina is a voracious predator of other small Diptera. The pictured specimen is a female, possibly gravid, judging by the appearance of the black intersegmental membranes on her swollen abdomen - or just had a very good lunch! On the wing May to September.